Resurrecting the dead in Dublin. | Come Here To Me! « Lord Ardilaun died a century ago today. Resurrecting the dead in Dublin. There are many to ways to make a living, and not all of them noble. A profitable enterprise for some in the eighteenth and early nineteenth centuries involved the physical digging up of freshly buried bodies, which could be sold to medical schools where they were in considerable demand. Far from being just the stuff of fanciful folklore, we have plenty of evidence that this was a real problem for the authorities in Ireland, in the form of newspaper reports of scuffles in cemeteries and unusual towers constructed in cemeteries with the aim of allowing ‘watchmen’ to catch any would-be thieves in the act. The term of choice for those who engaged in this activity today is often ‘resurrectionists’, though in their day they were frequently known as ‘sack-em-ups’ here in Ireland. There was, of course, great educational importance in the bodies of the dead to those studying medicine, and for centuries the bodies of criminals had been dissected. Indeed, there was a Murder Act in the 1750s which noted that only corpses of executed murderers could be used for dissection. This was a fairly gruesome act, with the full title ‘An act for better preventing the horrid crime of murder’, and it actively encouraged “that some further terror and peculiar mark of infamy be added to the punishment”of those who murder others. As Rónán Gearóid Ó Domhnaill has noted by the nineteenth century “the number of people studying medicine had risen and demand far exceeded the supply, thus corpse robbing developed into a profitable business.” This greater demand for bodies meant that the focus was no longer strictly on the physical remains of dead criminals, but acquiring bodies of totally innocent people to meet the growing demand. Bodies were provided not alone to medical schools, such as the Royal College of Surgeons, but also to Trinity College Dublin. Removing a body from the ground frequently involved utilising a hook to pull the body from the coffin, having first smashed a hole into the wooden box. Early Dublin resurrectionists received only a guinea for a ‘subject’, but as the trade developed into something of a profession prices rose, with prices as high as £10 or even £20 secured on occasion. Bodies of children were frequently sold by the inch, while hair and teeth could be sold separately. As Gerard Maguire has written, owing to the strange legal situation at play, “a peculiarity of the profession was that if a resurrectionist was caught in the act of body-snatching he was brought to justice and charged only with stealing the shroud in which the body was wrapped. Hence, the professional sack-em-up always took the precaution of removing the shroud before carting the body off.” Christopher Dixon, who served as porter at the Royal College of Surgeons in Ireland in the early years of the nineteenth century, was caught in Bully’s Acre on one occasion by a mob and “after tying a rope around his waist the mob dragged him to the Liffey into which he was ducked repeatedly.” John T. Kirby, son of the President of the College of Surgeons, was reportedly killed by another such mob! 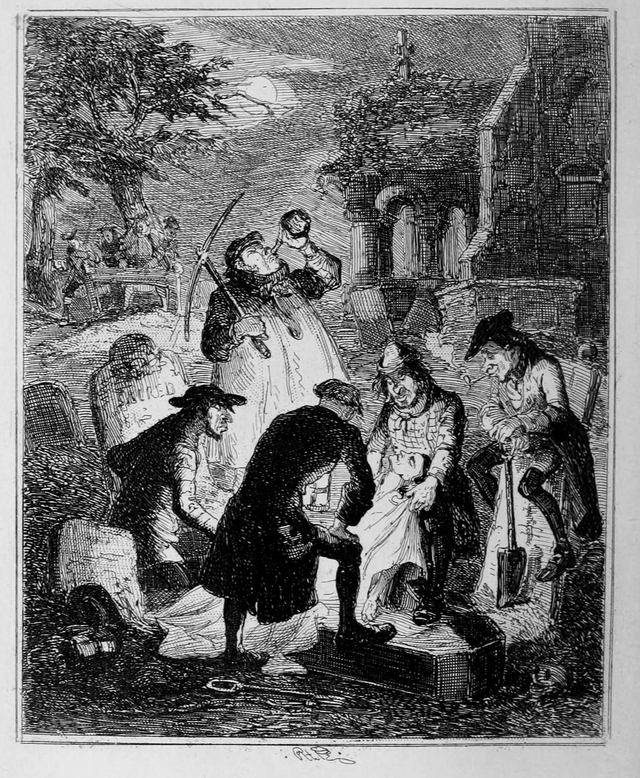 On Friday evening last, about six o’clock, a party of resurrectionists rushed suddenly into a house in Bow Lane, where the corpse of an aged female, named Carrol, was being ‘waked’ by her friends and neighbours….and succeeded in possessing themselves of the body, which they bore off, before the persons present could offer any effectual resistance. The ruffians acted with the most revolting indecency, dragging the corpse in its death clothes after them through the mud in the street, and unfortunately baffled all pursuit. Information was shortly after given at College Street police office of the transaction, and an officer with some constables immediately visited the College of Surgeons. They were informed that the body had not been brought there, but they were not permitted to search. Several of the fellows engaged in this outrage are well-known resurrectionists, but though the police are acquainted with their haunts, strange to say that none of them have been apprehended yet. Bully’s Acre was a particularly popular location with Dublin’s resurrectionists, as the cemetery was the burial-place of many of the poor inhabitants of the city prior to the opening of Glasnevin Cemetery. 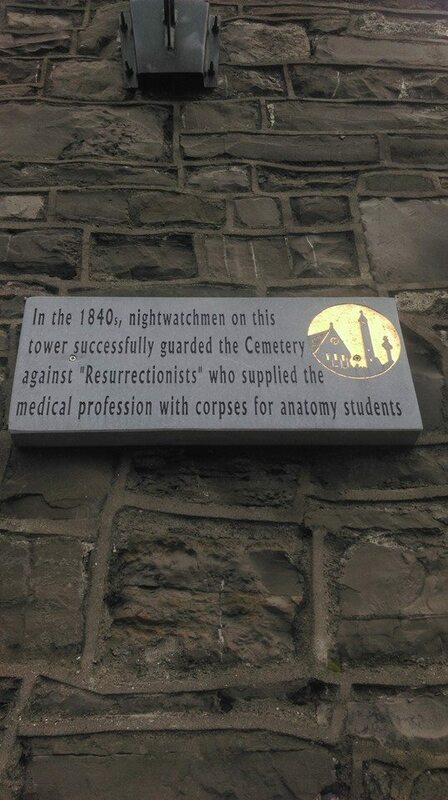 There is a popular story of one well-known lecturer in anatomy, Peter Harkan, leading his students here on a resurrectionist excursion was stopped by watchmen, and later died as a result of the injuries he sustained. 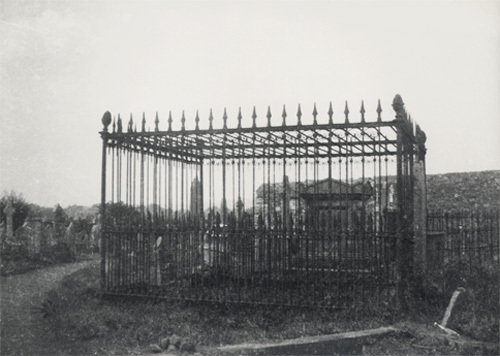 One one occasion in November 1825 a sentry at the cemetery captured Thomas Tuite, who was a known resurrectionist in the city, in possession of several bodies. The presence of watchtowers in cemeteries in Britain and Ireland give an indication just how seriously the authorities took the potential robbery of graves. In 1842, a series of watchtowers were erected at Glasnevin Cemetery, while watchmen also availed of Cuban Bloodhounds, right into the following decade. Controversial as the early Anatomy Act was, it did bring about a marked decrease in the activity of resurrectionists, as a greater supply of bodies was available by entirely legal means to anatomists. Still, the Glasnevin watchtowers remain today as a reminder of a macabre trade. 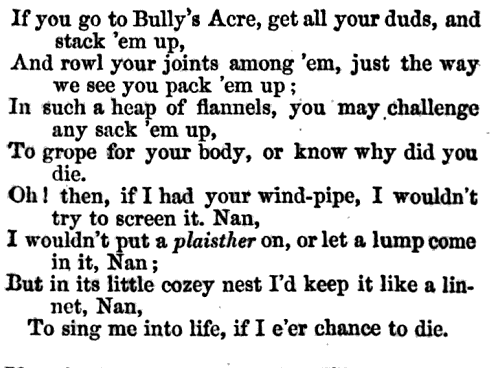 A nineteenth century vrse referencing Bully’s Acre. And if they stirs be plazed to trip-em-up. Hope to see you Donal on one of my tours of Bully’s Acre. You never know, we might do a bit of body snatching! Thanks for an interesting read. I hadn’t heard the story about Kirby’s son before. Do you have any figures on the extent of body snatching after 1832, when the Anatomy Act came in? I’d love to know, as the Act was supposed to do away with body snatching (after Burke and Hare), by allowing surgical schools to take the unclaimed bodies of people from poor houses. 1832 was also when Glasnevin cemetery opened, so I’ve often wondered whether by then they needed the towers and the “Cuban blood hounds”.